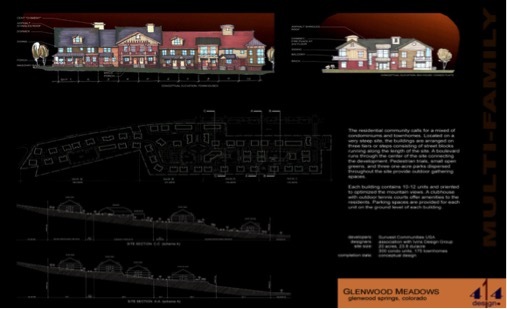 This project is to construct four apartment buildings to include 60 residential units and a common building, in West Glenwood, Colorado. 50,000 cubic yards were excavated, 20,000 was compacted to 95% compaction and 30,000 was exported. 30,000 cubic yards were over excavated and brought back to grade at 100% compaction. Poor soils required the over ex of the building structures and the roads. All fill was screened to 5 inch minus. Onsite utilities included 800 feet of certa-lock 8 inch sanitary sewer, 1500 feet of 8 inch snap lock ductile iron pipe for domestic water, 1000 feet of 8 inch snap lock ductile iron pipe for raw water, as well as 2000 feet of various sized HDPE storm drain. 3200 square feet of Redi-rock walls were constructed to deal with the sloping terrain of the site. Walls were used to retain the soil from the lower to upper building levels.